Originally from Mexico, Sukhdev is the longest practicing KY teacher, trainer and organizer in Estonia. She is a founding member of the Estonian NKYTA, and served as the first president of the association. 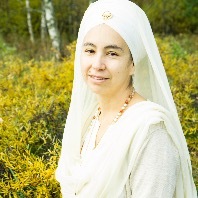 She is director of Dharamsaal, School of Kundalini Yoga and Humanology in Tallinn, Estonia and is currently developing the Rajamaa Ashram and Miri Piri Estonia democratic, dharmic and forest primary school in the Ashram lands near Tallinn.